That’s right! Starting out 2014 with some really great press! 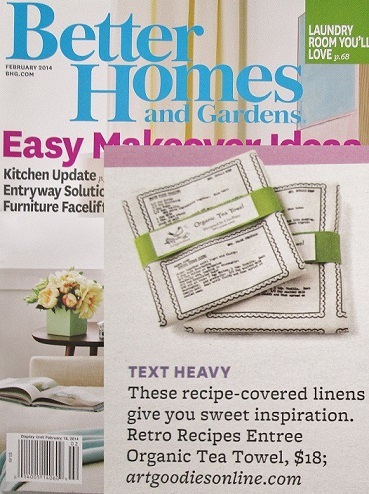 In addition to being in Midwest Living, artgoodies is also featured in the February issue of Better Homes and Gardens! Check out page 10 and you’ll find my retro recipe dessert towel with a mention of the entree! Yay! Sorry for the delay! I know I’m a couple weeks late with my color of the month with vacation and a pile of work waiting for me when I got home. So here it is, color of the month January 2014! Fresh cool aqua blue seems like a crisp way to start off the New Year, don’t ya think! Basically everything from my personal collection, sorry nothing for you to buy this month! 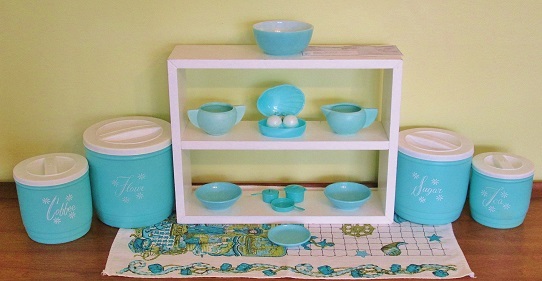 Fave items: recently scored this set of aqua canisters at a thrift, awesome small rare imperial ware melmac bowls and butter pat perhaps, tiny aqua play cookware, cream and sugar pottery-not sure the maker on these, hilarious and super kitschy shell and pearl salt and peppers! Plus a new small Hazel Atlas aqua glass bowl on top. 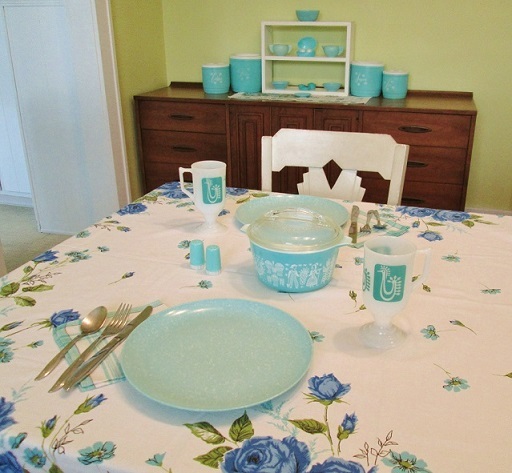 Gorgeous vintage blue floral tablecloth makes way for speckled aqua melmac plates, plaid aqua napkins, rooster mugs, aqua salt and p's and small pyrex casserole. Yay! It feels awesome to start out the new year with great magazine press! 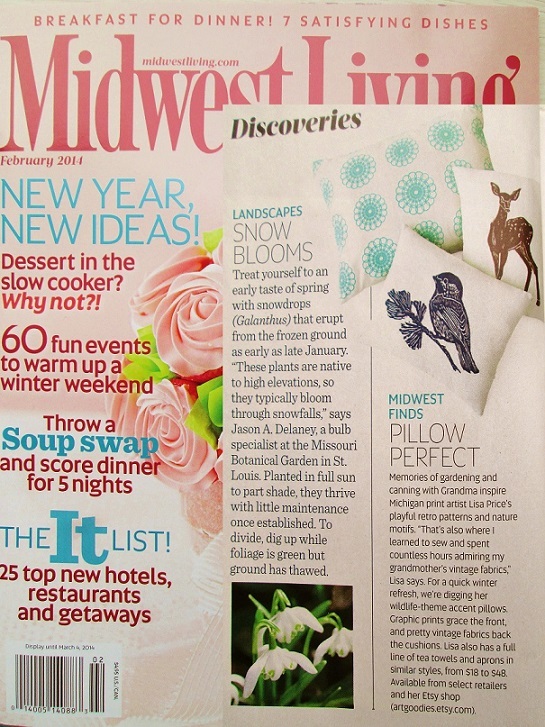 Check out the little artgoodies feature on page 12 of Midwest Living, the Feb 2014 issue! AND in honor of this press I’m offering 20% off of squillow pillows and sham pillows this week! Sale starts at noon today and ends at noon on January 19th! Click here to go right to the shop! I just got back from a wonderful New Year’s Break. I headed West to the beautiful dreamland of the Pacific Northwest to visit one of my dearest friends. I was lucky that my travel plans just skirted around a crazy polar vortex storm. While I was enjoying lush greenery, gorgeous scenery, and 45 balmy degrees, home was getting blasted with monster snow and sub zero temps! It felt great to take a break, disconnect from work and technology, and reconnect with a couple good friends. 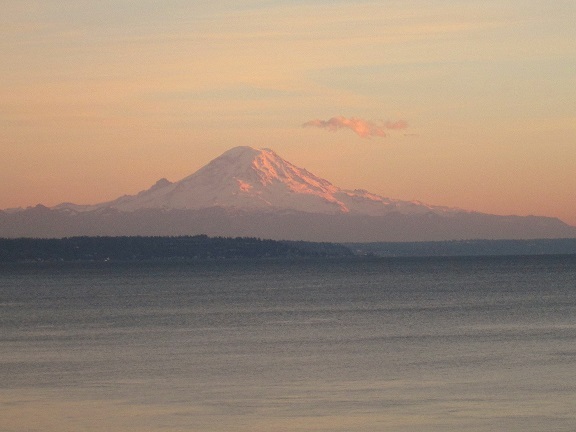 Plus we got to spend 4 days at the most beautiful place on Bainbridge Island, thanks Wanda and Rico!!! (aunt and uncle to a college friend) If you are headed out to the NW, Seattle area, you have to stay at their place which you can rent on VRBO! They are gracious hosts with a gorgeous comfortable place, stunning views from every room, and basically it just feels like home and your life is perfect! They’ve thought of everything you would need away from home! 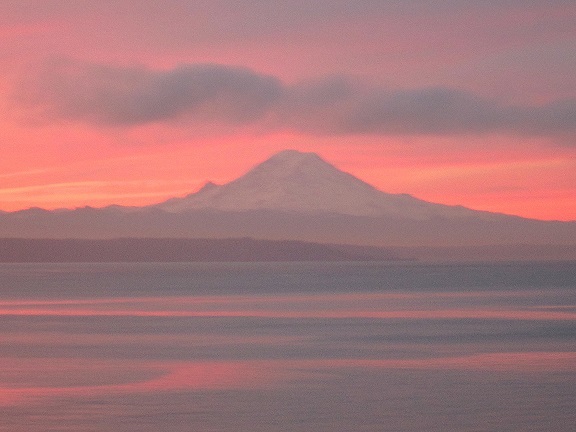 As an early riser, every morning I watched the sun come up over Puget Sound and Mt. 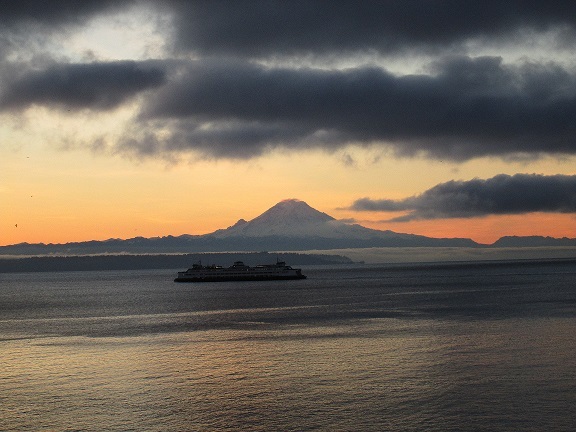 Rainier, seals swim by, and eagles fly. Here’s the link, seriously, click here and book it now! Below are pics from the deck! Stunning! Also, check out some more vacation pics on my flickr page here.